Waterfowl hunt planning begins with watching waterfowl migration reports from waterfowl web sites and the Missouri Department of Conservation. Choosing when to waterfowl hunt from monitoring the migration and weather makes for a more predictable method to maximize when to waterfowl hunt. Those with dogs will find pheasant hunting available before and after waterfowl hunts. 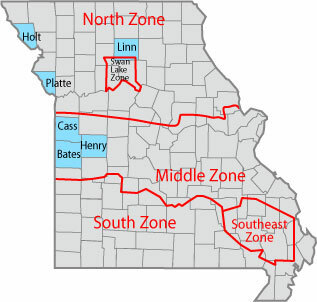 Mid-America Hunting Association wetlands are all in Missouri. 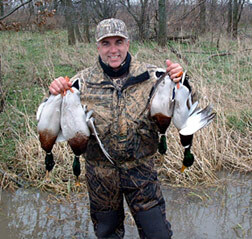 Waterfowl hunting includes both regular waterfowl and late season goose. When planning a goose or duck hunting trip for the first time call and talk to one of the Association staff to get recommendations on where to hunt based on driving plans, wetlands preference and where we have seen the best migration concentrations. Once duck hunters have a hunt or several they begin to develop their favorite areas and simply call in for reservations. Goose fields do not have blinds. Hunters are welcome to bring their own temporary blinds. Blinds and decoys may be left in the field for multiple day hunts. There is not a limit to how large a decoy spread that may place. Boats are provided by the hunter. All wetlands access is primitive. Most boats used are a canoe or small boat to hall equipment. Dogs & Decoys provided by the hunter. Motion decoys are legal. Vehicles park where indicated on our maps. Maps are available online after membership include state highway, Association property and of our wetlands a detailed line map showing the wetlands layout. Reservations are to a numbered blind. Combo Hunts with duck, goose, upland bird or deer are possible as seasons overlap. Lodging is by local motel. Highlighted are the counties where we manage wetlands. Exact locations of all Missouri hunting land is available to members by way of an online map library.